Setting up a new instance of SQL Server Reporting Services (SSRS), and getting things configured. What I noticed is that the first time I hit the SSRS site, it would take forever to load, then it would be fine as I used it, and then later after no use, I could come back and it would be slow again till it loaded once, then fast. 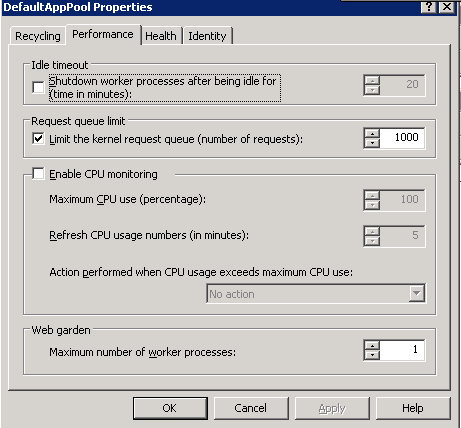 My first thing to think of was the App Pool settings in IIS, so I checked them..
Uncheck that, and you are good to go. Of course if you have tons of usage, then there is no need for changing this, but on a site you might be building up slowly, you would see the effects of this right away. Previous Post Pandora for iPhone Security Flaw? Next Post Panasonic Helped and I Got "Consumeristed"
Awesome, this took my display time for the SSRS page from about 10 minutes to 5 seconds. Thanks for the info. Excellent, it worked for me…Thank you thank you !